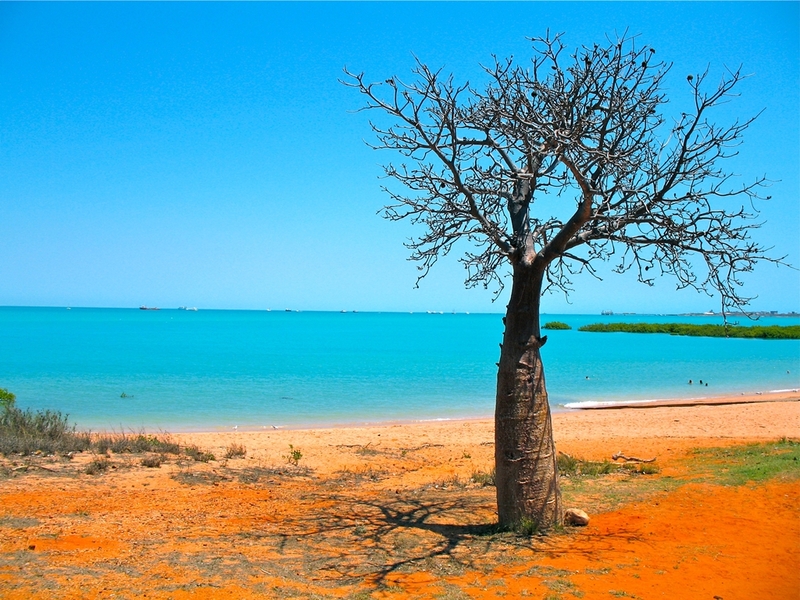 The small pearling town of Broome is known for its spectacular natural beauty and rich cultural history – the town is, after all, set on the traditional land of the Yawuru people. Visitors come from far and wide to experience the unforgettable Cable Beach sunsets and the region’s action-packed adventure tours, unique wildlife and prized silvery pearls. And they leave with a deeper understanding of the indigenous and European cultural influences that have made Broome the lovable little Aussie town it is today. The jewel in Broome’s crown is Cable Beach. This 22-kilometre stretch of white sand and calm water is the perfect place to while away a long, lazy day. As late afternoon approaches, watching the burnt orange sun dipping below the horizon is a truly magical experience. For natural waters beyond the sea, head to Horizontal Falls. Described by Sir David Attenborough as “one of the greatest natural wonders of the world”, Horizontal Falls is a spectacular rapid tidal movement that gushes through 2 narrow gorges. The direction of the water flow reverses with the changing tides, making this natural phenomenon even more unique. Guided tours are available. For the animal lovers out there, a trip to Malcolm Douglas Crocodile Park to step through the jaws of a giant saltwater crocodile and into a thrilling nature haven is a must. You’ll also spot kangaroos, wallabies, emus, snakes and native birds throughout the park. The best time to be there is 3pm when it’s feeding time for the crocodiles. For something more historical and thoughtful, a visit to Japanese Cemetery is a stark reminder of Broome’s pearling past. The small town of Broome is easy to navigate on foot, so you’ll have no trouble finding your way around the main eating hubs. The Chinatown area provides a range of popular dining options from traditional Asian to East-West fusion dishes. For food with a view, enjoy an alfresco café brunch or waterfront wining and dining experience overlooking Roebuck Bay. The resorts around Cable Beach offer fine dining restaurants and poolside bars perfect for a relaxed evening sipping a cocktail or two. There is a good range of quality accommodation options in the town of Broome itself, while luxury experiences are reserved for Cable Beach, which is a 10-minute drive away. This is the place to splash out on a private bungalow, villa or suite and, while you’re at it, indulge in deluxe spa treatments or a leisurely game of tennis. From the region’s famous pearls to the local indigenous art, Broome is a great place to pick up truly unique souvenirs that you’ll treasure for life. Perhaps the most famous of the luxury pearl boutiques is Paspaley, which is located on Short Street. If your budget doesn’t quite stretch that far, other providers around town offer excellent quality pearls at more affordable prices. Be sure to visit the local galleries, which showcase indigenous artists from the Kimberley region, where you can purchase one-of-a-kind paintings and handcrafted didgeridoos. For a laid-back local market experience, visit the Courthouse Markets on Saturday and grab a coffee while you browse a range of locally made crafts, jewellery, clothing, home wares and fresh food. Hang out with the locals at Gantheaume Point Beach, which joins up with Cable Beach. Spend an afternoon relaxing on the soft sand and splashing about in the clear water. For a little more adventure, follow the marked path to discover fascinating dinosaur footprint casts. These genuine 130-million-year-old footprints can be seen, if you’re lucky, at the bottom of the cliff at low tide. Gantheaume Point itself offers an excellent vantage point to take in stunning views of the Indian Ocean and the contrasting vibrant red rocks. Stay around until dusk to enjoy a truly spectacular sunset.